Philadelphia Assembled members do some planning. The Philadelphia Museum of Art will work with acclaimed Dutch visual artist Jeanne van Heeswijk and collaborators across the city to present Philadelphia Assembled, van Heeswijk’s most expansive project to date. This collaborative endeavor will invite change agents throughout the city to collectively imagine a present and future Philadelphia. 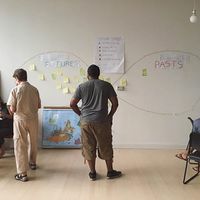 Developing in two stages, Philadelphia Assembled will be organized around five notions, or what van Heeswijk calls “atmospheres”, each derived from preliminary conversations about the city’s changing landscape. In the first stage of the project, a series of eight sites throughout the city will offer installations or events ranging from discussions to community meals that will encourage audiences to share their perspectives on the city, its history, and its future. In its second and culminating phase, the project will move into the Museum’s Perelman Building, where the eight sites will be re-assembled in a participatory and interactive display that will activate the building's public spaces. Look Who’s Gone Radical, Philadelphia Citizen, June 27, 2017.